Upon searching for more information about Kenney, I was surprised to not only verify him as a resident of Giles County, Tennessee, but learn that he would be hanged as a spy a year later under the orders of Confederate Gen. Braxton Bragg. 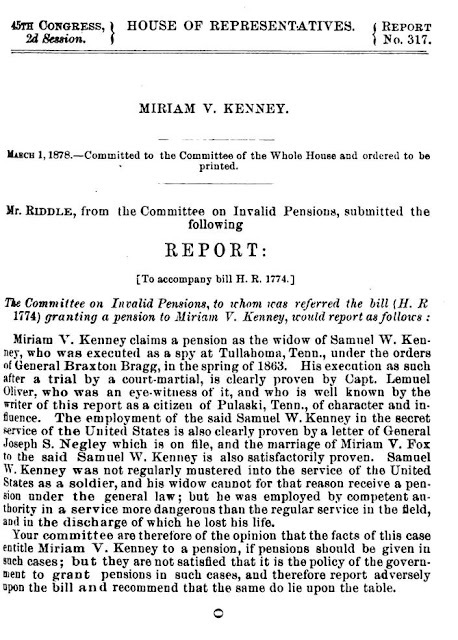 Fifteen years after the incident, his wife Miriam V. Kenney received a $12/month special pension by act of Congress, with a corroborating letter from General Negley testifying that Kenney indeed was a spy. 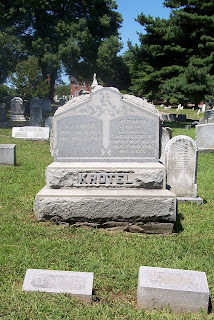 According to an Ancestry.com forum, the family did not know what happened to Kenney, and it was only in the 1890s that his body was returned to Illinois. 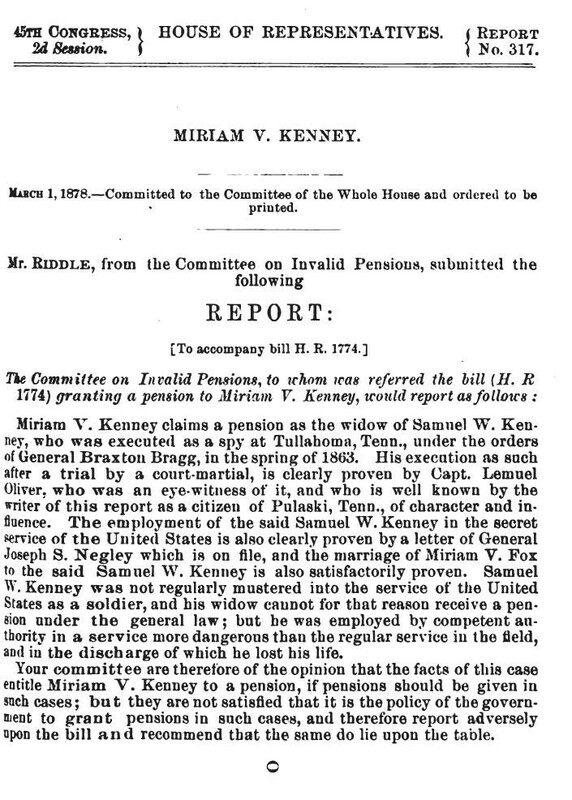 I'm not sure how to interpret Kenney's status, whether he was actually acting as a spy, or whether he simply aided the Union army when it was in his neck of the woods. It would be interesting to see the Negley letter, as Negley's pattern of loyalty and helping people around him makes it seem like he would have gladly written to help Kenney's widow based on casual encounters with Kenney. I'll have to watch for more information about Kenney and the circumstances that led to his execution. Fourth and fifth letters in the grand tour of Lancaster journalist J. R. Sypher. Read an introduction here. 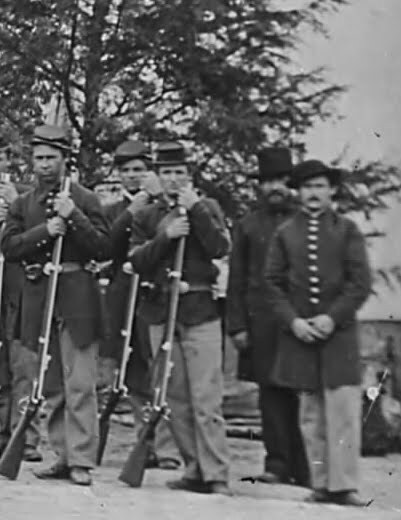 I'm not sure if any of the Lancaster County Regiment soldiers would have believed in when they left home in October 1861, but over seven months later they were entering Alabama without taking a single casualty in battle. 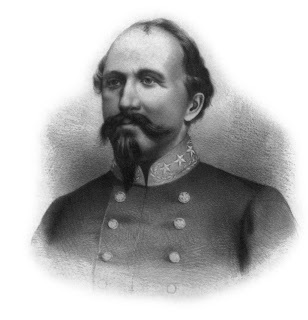 While the main elements of the Union and Confederate forces were maneuvering to the west in what would develop as the Siege of Corinth (Mississippi), General Negley's division under command of General Ormsby Mitchell was pushing forward into Alabama from camp at Pulaski, Tennessee. When we arrived at the shore, 20 or more Rebels were seen on the opposite side. A few shot, and shell scattered them in every direction. We drew lots to see who would go over with the boat, when John Cramer, Fred Offlebach were drawn from our squad. They burned one large ferryboat, brought 2 flats, 2 dugouts and one large boat across with them. 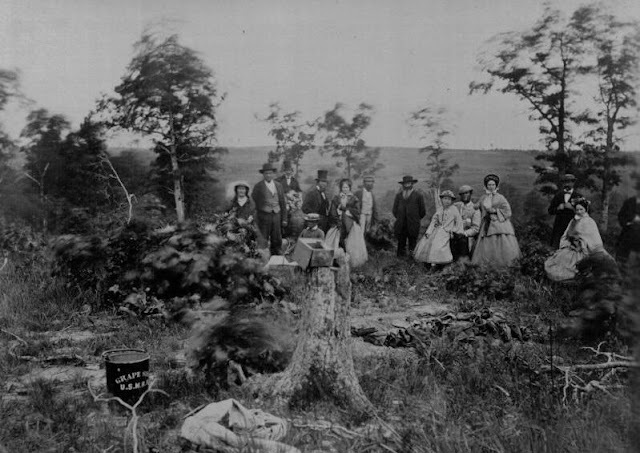 Read more details in two letters by J. R. Sypher dated May 14 and May 15, 1862. 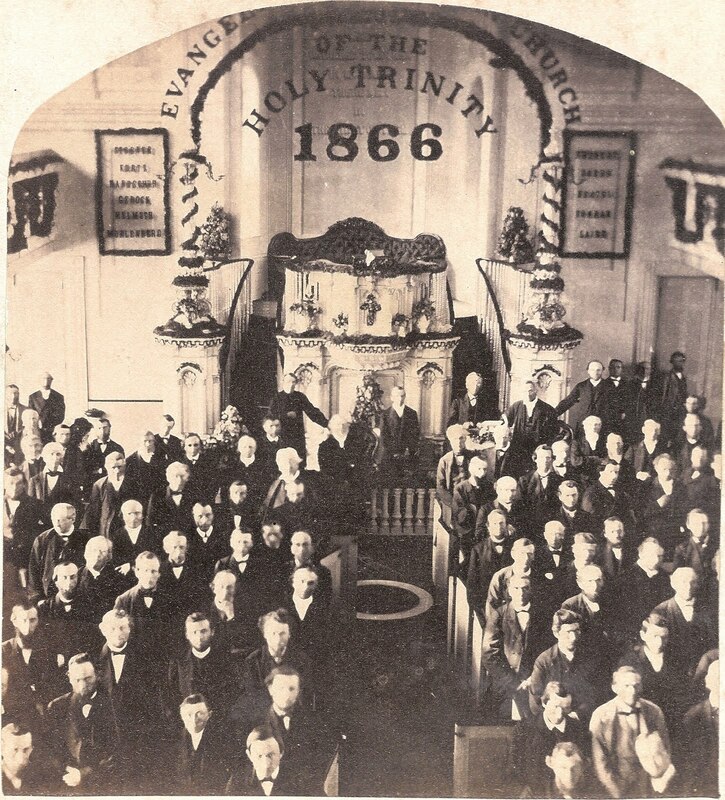 The General Synod met here in 1862.
is depicted in the image above (from a stereoview, vws). 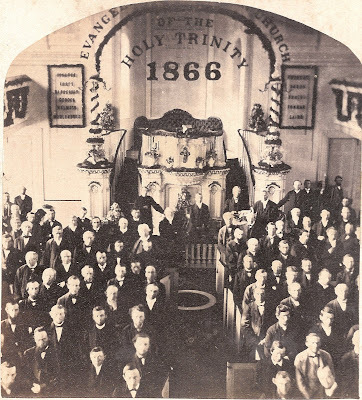 As one of the few national church bodies not to have separated by the Civil War's outbreak in 1861, the Evangelical Lutheran General Synod convened in Lancaster at Trinity Lutheran Church from May 1 to May 8, 1862. 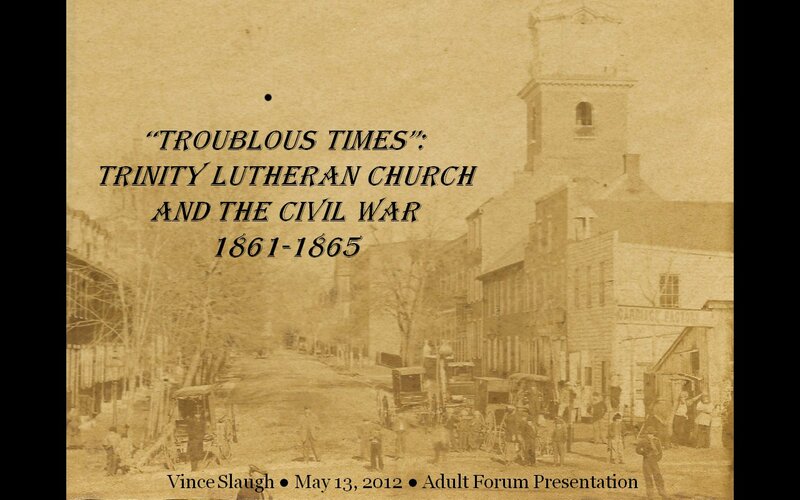 Without any dissenting Southerners present, the 100 or so Lutheran leaders finally forged a consensus to take a stand on the war's meaning, the morality of slavery, and the emerging question of emancipation. 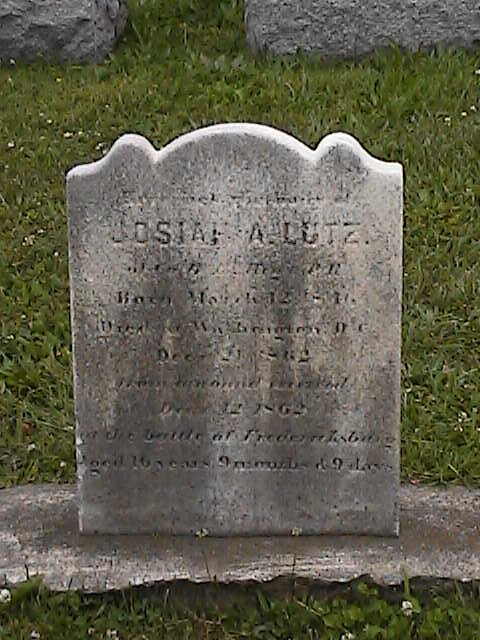 Resolved, That while we recognize this unhappy war as a righteous judgment of God, visited upon us because of the individual and national sins of which we have been guilty, we nevertheless regard this rebellion as more immediately the natural result of the continuance and spread of domestic slavery in our land, and, therefore, hail with unmingled joy the proposition of our Chief Magistrate, which has received the sanction of Congress, to extend aid from the General Government to any State in which slavery exists, which shall deem fit to initiate a system of constitutional emancipation. As anticipated, it sparked a day’s worth of debate, the detailed minutes of which are presented at the end of this post. Some attendees criticized for being too weak, claiming constitutional emancipation validated the ownership of people as property. Others spoke against endorsing such a specific means of ending slavery, saying that the Lutherans had no more right to prescribe specific policies for Congress as Congress had to prescribe how the Lutherans interpret the Augsburg Confession. 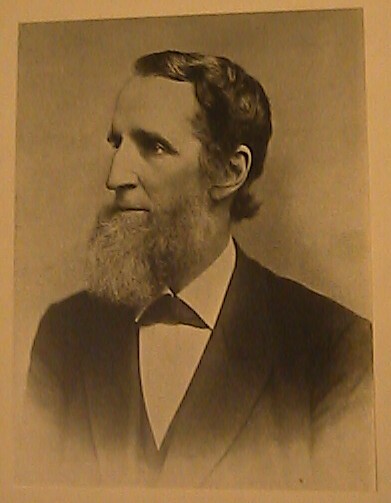 Interestingly, the abolitionist Samuel Simon Schmucker of the Lutheran Seminary at Gettysburg suggested leaving out the subject of emancipation entirely due to the “unhappy effects” making statements on slavery had always had on other Synods. The 1862 Lutheran General Synod convention represents one more example of Northerners’ awakening to emancipation as a real possibility that occurred over the course of that year. It parallels recent letters from our Lancaster soldier-correspondents in Tennessee who have begun to witness that the military mission is difficult to untangle from slavery, and that the current policy is unsustainable (links: Sypher, Witmer). 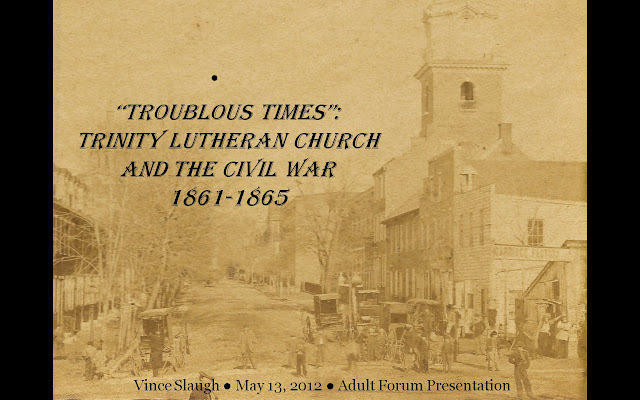 The May 10, 1862, Philadelphia Press cited the Lutherans' actions in Lancaster as evidence of a shifting tide in Northern opinion. The stance on slavery also had unintended consequences for the Lutherans, which was very divided by two distinct visions for the Lutheran Church in the New World in years following the Second Great Awakening. Pietists wanted to see a Lutheran Church emphasizing revivalism and spirituality in close union with other Protestants, while confessionalists stressed a stricter adherence to the Lutheran Confessions. 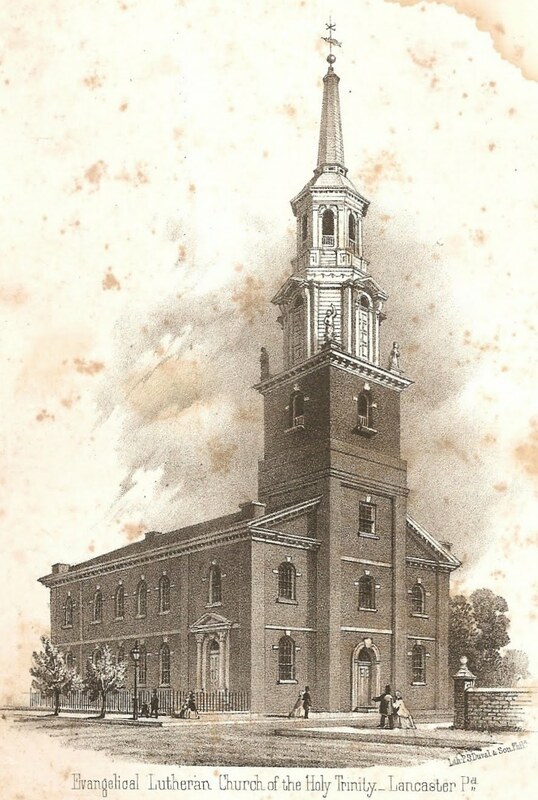 In the next two General Synod meetings, in 1862 and 1864, the confessionalist-leaning Pennsylvania Ministerium walked out and was locked out of proceedings. 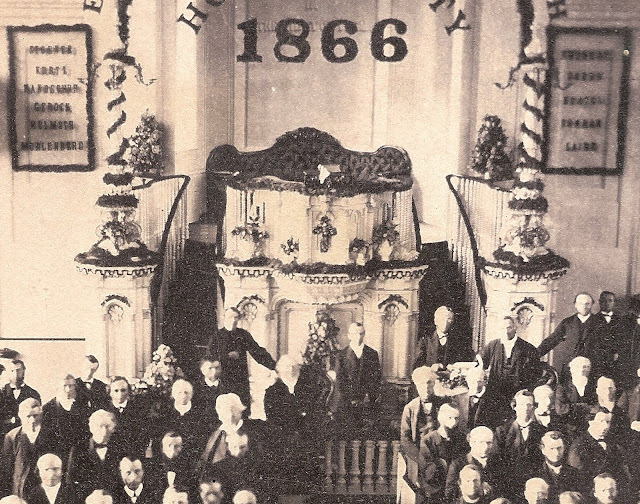 In 1866, the Pennsylvania Ministerium met again at Trinity Lutheran Church in Lancaster to announce the formation of a confessionalist national Lutheran church body. The "General Council" resulted, although it ultimately failed to meet expectations due to its inability to woo more conservative Midwestern Lutherans (e.g., the Missouri Synod). Newspaper proceedings: The Lancaster Daily Evening Express covered the debate extensively, although its record is unmicrofilmed. The Lutheran Missionary and Lutheran Observer both reprinted its coverage, and represent the two different views mentioned above about Lutheranism in America. The Philadelphia Press reprinted the resolutions on May 9, 1862 (link). Two relevant assessments worth reading are Mark Noll's article, "The Lutheran Difference," and The Rise and Fall of American Lutheran Pietism by Paul Kuenning (1988). (I prefer Noll's more even assessment to Kuenning's indictment of Confessional Lutherans as political quietists). 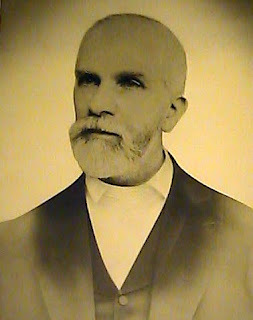 The Life and Letters of William A. Passvant on Google Books. "Pastor Eggers' Reflections (1859-1862)", First Evangelical Lutheran Church, Nashville, Tennessee. 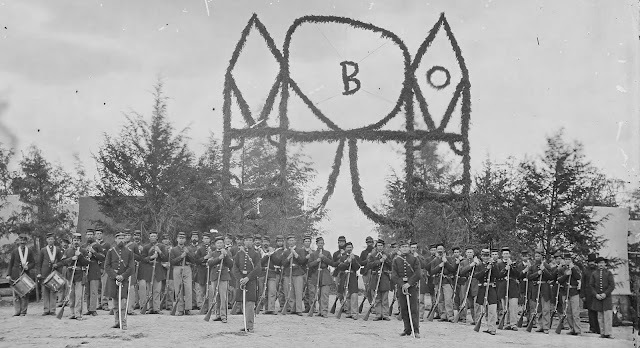 Over at Bull Runnings, Harry Smeltzer has started a conversation with Ron Baumgarten of All Quiet Along the Potomac about accounts of rebels' desecrating the remains of Union dead at the Battle of Bull Run. Specifically, they are wondering about the accounts of the Pennsylvania Reserves who passed through the area in April 1862. I thought I recalled something about this in my Lancaster correspondence, and it turns out my hunch was right...so here's a quick post with that letter. A simple Google search of "unburied Bull Run" turns up many results, as well. The main soldier-correspondent for the Lancaster Daily Evening Express in the Pennsylvania Reserves was a private in Capt. 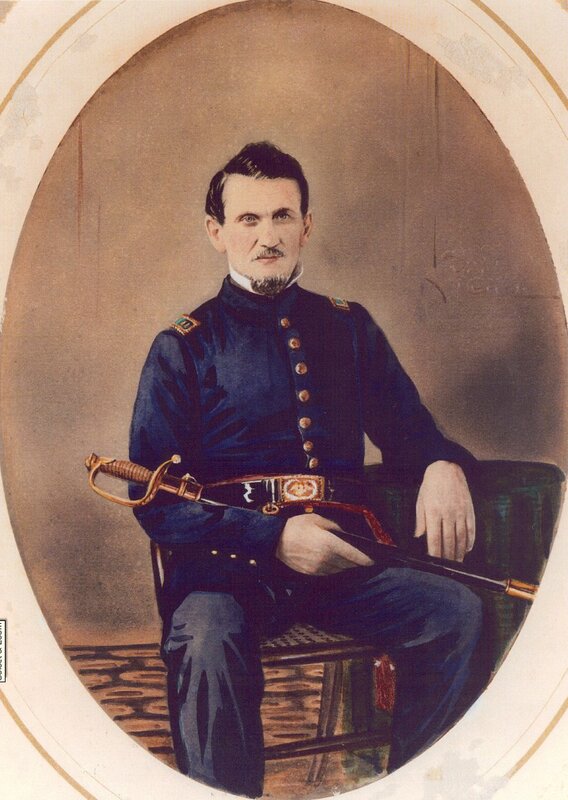 Easton battery of Pennsylvania Reserves artillery named George McElroy. His letter dated April 16, 1862, describes a walk over the battlefield and the appalling sights he took in. The horror he expressed fits in with a pattern of indignation McElroy directed towards Southerners in early 1862 for various reasons such as the vandalized state of one of the Washington family graves (I think Martha Washington at Mount Vernon, but I might be wrong) and especially the lightened skin tones of slaves. The following post is the first in a series of a dozen or so letters by Lancaster lawyer, journalist, and civilian adventurer J. R. Sypher during his travels through the Western Theater as a sort of "embedded reporter" in May and June 1862. On May 2, 1862, former Daily Evening Express assistant editor Josiah Rhinehart Sypher left Lancaster for a two-month tour of the Western Theater, where he had spent time as a correspondent before the war. I've written about Sypher--and brother James Hale Sypher of Standard's Ohio Artillery Battery and brother A.J., Armorer on the USS St. Louis ironclad--several times before on this blog, including his letter after having been chased out of Memphis in June 1861 and a quarrel with the Democratic Intelligencer in August 1861 over dueling rallies in Drumore Township (which Sypher coincidentally refers to in the opening to his letter below). 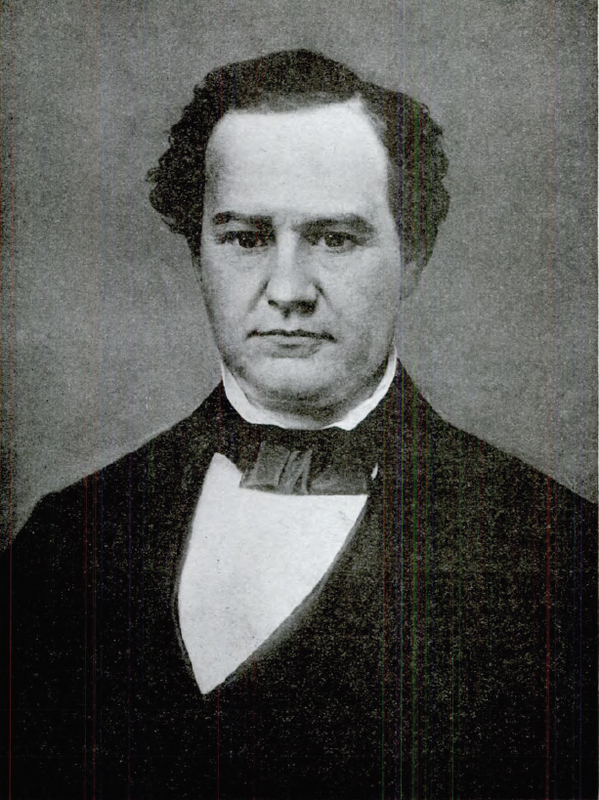 J. R. Sypher, Esq., formerly our Southern and Western correspondent, and more recently our editorial assistant, started for the seat of war in the department of the Mississippi, on Friday morning. He goes as special correspondent of the Express, being provided with a military pass from the War Department, authorizing him to go anywhere within the lines of the armies of the United States. For this we are indebted to the kindness of Secretary Stanton and Col. Sandford. The conditions of the parole attached to the pass are very stringent, but the Express has no cause to fear them, as we have never yet published a line involving the censure of the war department, although important information has been frequently in our possession in advance of its publication elsewhere. 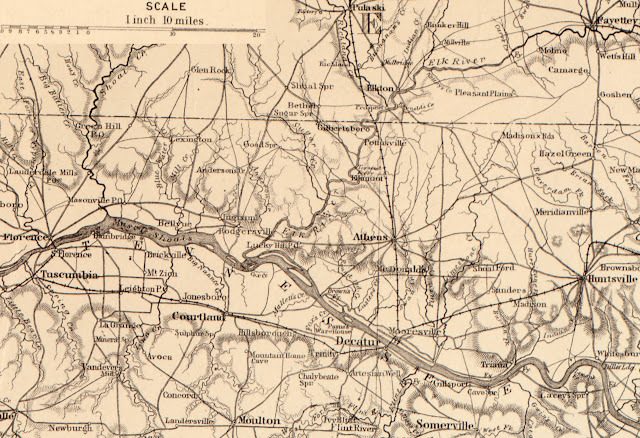 Mr. Sypher intended going direct to Corinth, and thence with Gen. Halleck's army to Memphis. 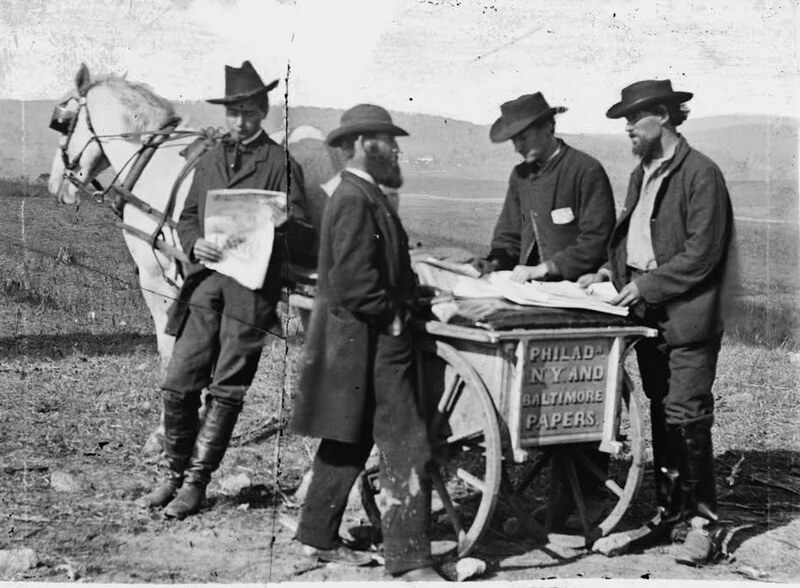 Being familiar with the country in the southwest, and having a pretty extensive acquaintance with the people there, his letters will no doubt be as interesting as valuable. Sypher penned his first letter in Louisville, the gateway to the Western Theater for Lancasterians during the Civil War. Lancaster maintained a strong patriotic and logistical connection to Louisville, cheering on border state warriors like Louisville Journal editor George D. Prentice and relying on the soldiers' aid infrastructure there to distribute goods to Lancaster soldiers and others in need. Word of the capture of Capt. Kendrick and ten or fifteen others from the Lancaster County Regiment quickly got back to Negley's brigade camp thirty miles north in Columbia and caused much excitement. 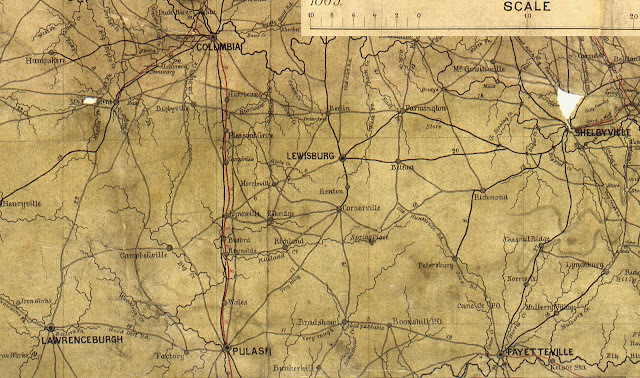 Around midnight, four companies--Companies C, E, I, and G--of the 79th Pennsylvania with some cavalry and artillery set out in the darkness to find out what was going on. 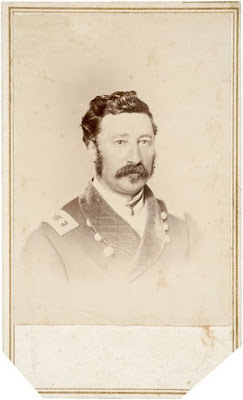 As a corporal in Company E, correspondent Elias H. Witmer made the forced overnight march of thirty-one miles. 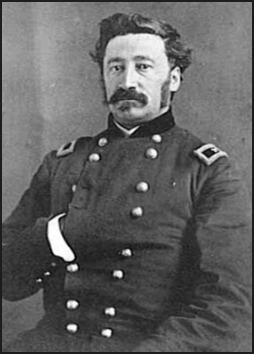 When the expeditionary force came within five miles of Pulaski, they ran Kendrick and the others, who had been lumped in with 200 prisoners from Gen. Mitchell's division and paroled. As paroled prisoners, Capt. Kendrick and the other men returned from the front lines. I'm not sure how the exchange process worked, but Kendrick sat out the rest of 1862 and would rejoin the army as a key staff officer for Gen. Negley.